This Shrimp Salad recipe, is slightly adapted from Ina Garten’s Barefoot Contessa Cookbook. It is the best Shrimp Salad that I have ever tasted! There are so many layers of flavor, starting with the shrimp being cooked with lemon in the water. The mayonnaise based dressing is enhanced with mustard and wine and the salad itself is flavorful with red onion and celery. 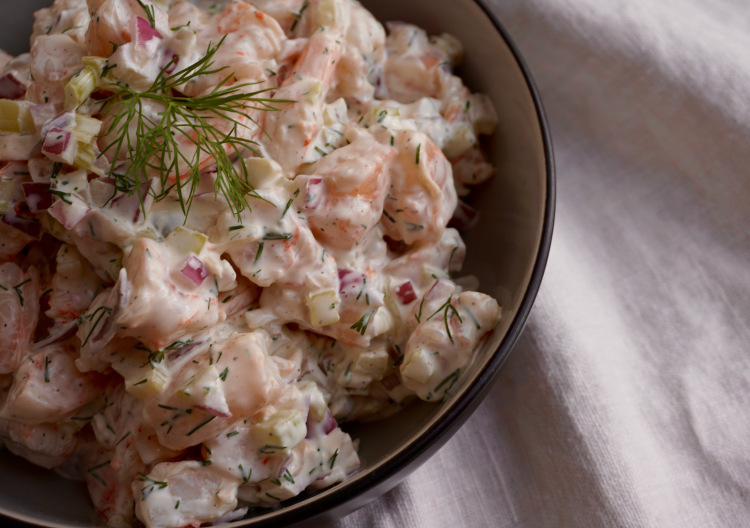 The secret weapon in this salad however is the fresh dill! It makes for an unusual and delicious salad. Bring 3 quarts of water to a boil with 1 tablespoon of salt and lemon slices in a large saucepan. Add the shrimp and reduce the heat to medium. Cook uncovered for only 3 minutes or until the shrimp are barely cooked through. Remove from heat, drain and rinse with cold water. Cut the cooled shrimp into pieces, about 3 pieces per shrimp. In a separate bowl, whisk together the mayonnaise, mustard, wine or vinegar, 1/2 teaspoon of salt, pepper and dill. Combine with the shrimp pieces. Add the red onion and celery and check the seasonings.